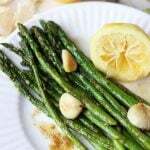 Oven roasted asparagus with lemon and garlic is so quick and delicious! Flavorful, perfectly cooked, it is a family favorite and great with anything! To trim asparagus, hold each end between your fingertips. Bend the asparagus, and it should brake about 1-2 inches from the bottom. Repeat with entire pound. Place asparagus and garlic on a sheet pan. Drizzel with olive oil, sprinkle on lemon zest, salt and pepper. Keep asparagus in a single layer on sheet. Bake for 10 minutes, until the ends are crisp and the asparagus is slightly tender.